I recently picked up a 13-inch mid-2012 Macbook Air as my primary laptop. I’ve been a devoted Linux user for quite a while, and posts like Matt Hartley’s experience have made me shy away from a Mac purchase in the past. My previous daily driver was an Aspire AOD250, which is a handy machine, but was getting a bit too slow and unusable to fit my needs (I recently spent three months in California where I was away from my desktop, more on this in a future post). If you would have asked me a year ago, I would have never thought I’d either buy, or be extremely happy with, a Mac machine. While Hartley’s post is a bit of a horror story, I’ve had a vastly different experience. I’m going to share the opposite side of the spectrum in what ultimately drove my decision, and in the end has left me a very happy consumer. I had been in the market for an ultrabook for a while, as I wanted to replace my netbook with an ultraportable that would be a bit more usable and less restricted by screen size. I wanted to wait for Ivy Bridge, and Apple’s announcement seemed like the perfect time to seriously start my search. My needs are typically just some basic software development, and my workflow is pretty much just a terminal, Emacs, and occasionally Eclipse, so I needed a machine that would fit that bill. OS X is, at its roots, Unix, and the terminal works pretty well coming directly from Linux. There are some small issues and missing packages, but for that there’s Homebrew, a ports system that makes installation of almost any command line binaries extremely easy. One of the reasons I’ve been drawn to Linux exclusively is the efficiency of the command line tools (Cygwin on Windows is a clunky and slow experience), and the user experience on Mac feels just as natural as on Linux. No one else has gotten the touchpad right, or even relatively close, on any machine I’ve used. To be fair, I haven’t used very much of the Synaptics multi-touch beyond the crappy two-finger scrolling only drivers on some low-end laptops, so this isn’t exactly a fair comparison, but the touchpad on the Air feels incredibly natural. Gestures feel great, and using the touchpad feels like a natural extension of the desktop, instead of something that I have to be precise enough to figure out how the drivers are going to deal with things. There are very small subtle things that make me smile – the separation of a Command and Control key means you have to relearn some shortcuts, but the Control key means that almost every text field in the OS has Emacs keybindings, which makes me very happy as an Emacs user. For me, 16:10 is infinitely more useful to me than 16:9 – even a 1440 x 900 display feels more natural to me than a 1600 x 900 display. Apple is still one of the very few manufacturers offering a 16:10 display. I’ve been extremely happy with the available screen area, and I find that the resolution is much more usable than anything else in the price range. The little stuff that typically didn’t work on Linux (Netflix, Steam (yes, I know this is changing), etc.) all work pretty flawlessly, which means I’m able to get away with not dual booting. The general consensus seems to be that Macs are less customizable than Linux, but I haven’t found this to be the case. In fact, Macs are about at the same level of customizability as Windows machines, but certain behaviors exist through command line configuration as opposed to the Windows registry. As far as non-system configuration, I found Mac OS X configurability to be far better than things like GNOME 3 – search integrated into the OS pretty much everywhere makes discovery of settings much better, too. I faced my first two big customization hurdles for two minor annoyances: switching Fn and Control, and playing back non-supported media codecs. From what I’d read, I expected these two things to be impossible, but instead I’ve found that it was extremely simple to get working: KeyRemapForMacbook took care of the first problem, and Perian took care of the second. Other minor desires, like Aero-snap style window splitting, were easily solved with things like Cinch. On the whole, I’d say while OS X certainly isn’t customizable to the extreme detail of some Linux environments, its definitely on par with Windows, and fits my typical needs. While most of the OS X ecosystem works great for what I need, there are some issues still. First, package installation is a mess. Everything is a self-contained .APP folder, unless your application needs to write to any other folder, in which case you get an install Wizard, and absolutely no option to uninstall anywhere. Your only option for uninstalling anything that used an installer is manually deleting files. Repositories are much better for this on Linux, and while the App Store tries to do this, it’s too commercialized for me to see it becoming a standard anytime soon. iDatabase crap. Every iApp (iPhoto, iCalendar or Calendar or whatever, etc) all use a proprietary database format that makes backing up your library impossible. Unless you use iCloud. Hmph, how convenient. Needless to say I swapped out iPhoto for Picasa and am much happier. Surprisingly, Messages (aka iChat) isn’t a terrible chat client. .DS_Store folders are everywhere, which are even more annoying than Windows’ thumbs.db or similar. Luckily, most intelligent software (Dropbox, Google Drive, etc.) are intelligent enough to ignore them, but it still typically confuses anyone I send a ZIP file to without thinking. Don’t believe the whining. I was sick of dual booting and wanted a general purpose laptop that would serve my development needs well, and this fit the bill perfectly. I’m not suggesting it’s for everyone, and there are certainly a lot of hard-core Linux users who will certainly find things to miss. For me though, Linux has always been the most efficient tool to get development work done with, and for an all-around portable machine, this fills the same role perfectly. 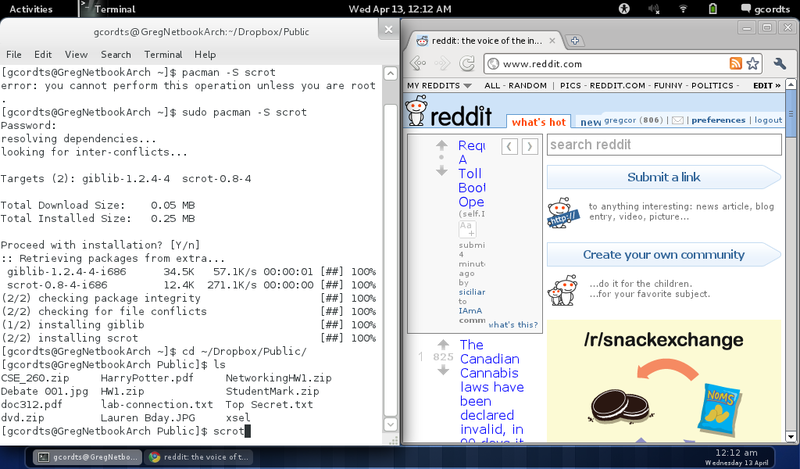 Linux will always have a spot on my desktop, but I’m extremely pleased with this machine for mobile development. GitHub is great, and has basically surpassed any other project community. I get why it’s popular, and I use it myself for open source projects, but the fact is, it’s way too expensive for non-public projects. I looked into a bunch of other Git hosting solutions, and they all have the same crappy bottom line: $8/month. BitBucket has a free plan for a small number of collaborators, but that’s a bother, as you still have some strange licensing restrictions. The fact is, for a few bucks more, you can solve your own problems and get much bigger bang for your buck. You’ve got a few options, but they all boil down to the same point: Get a cloud server for ~$10 a month. I’ve used Rackspace Cloud before with no problems, but I imagine they’re all more or less the same. If you’re a Linux newbie, there’s tons of tutorials for Ubuntu configurations that will show you how to set up almost any git server in very little time without learning too many Linux internals. You can always install something with a pretty web GUI, if you’re into that. Split the $10 a month cost with your buddies, and let them use it for whatever the heck they want too. Of course, if you’re into setting up some hardware, pretty soon $35 will take care of all of your file hosting needs forever, provided your ISP is keen on that sort of thing. I never really hated GNOME 3. I can’t say I was ever overly thrilled with it, but I feel like it gets innovation right to some level. I was willing to put up with Alt-`, no taskbar, and wonky dual monitor support in the name of “innovation,” but there was one thing I could never get used to: temporary notifications. If you happen to miss a notification, you can lose track of an IM conversation for quite a while. I eventually got frustrated enough with Empathy (the XMPP support is really lacking, and the whole thing felt buggy to me) to switch to Psi, which led me to another realization: tray icon notifications were now completely useless, and I’d be stuck with Empathy forever, as it seems to be the only one to support the (frustrating) GNOME 3 notifications. Well, I’ve had enough. I decided to cut the cord two days ago and it’s been smooth sailing since. 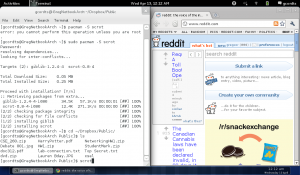 I’d share some screenshots, but I’ll make it easier for you: it looks exactly like GNOME 2. Both XFCE and GNOME 3 aren’t perfect, but it’s actually nice to have a bit of freedom outside of the GNOME 3 workflow-box for the first time in a while. Sure, there’s still some bugs (why do my desktop icons only fit on space common to both monitors? ), and sure it looks a tad bit dated (it’s as close to a GNOME 2 ripoff as you can get), but for the first time in a few months, I don’t feel like my desktop environment is choking me. Recently I found myself in a position where I needed to have a bit more control over Lab computers – more specifically, normal screen sharing is a bit useless in a coding lab, and I found that students often wanted to use laptops instead of existing lab solutions. LabHelper is a solution that runs through some central server. The client and server are pretty small. It’s a bit messy, but should be fairly extensible. I recently needed to move some Picasa 2 albums from an old computer to a new one given only the old files and album files. I’d about had it with albums, so I wrote a Python script to convert .pal (Picasa albums) into regular folders. It chokes on unicode, but dumps errors to a file for you to resolve them – just run this in a directory with your .pil files and it will create subfolders for each album and copy the pictures into them, as well. Use at your own risk. multiftp is a multi-threaded (multiprocess) command-line FTP uploader that allows easy recursive uploading of directories. It provides an easy way to schedule fast FTP uploads via batch scripts. Works via multiprocessing to circumvent threading problems. Ideal for situations where you need to upload an entire folder in script (i.e. publishing a website via FTP). Run mtftp.py -h for a help file. The software is licensed under the MIT license, whose text can be viewed in the program source. Note: See update for GNOME 3.3/3.4 at the end of this post. I’ve already expressed some disappointment in the default multi-monitor behavior in GNOME 3 on the dev’s blog (read: I posted an angry rant in the comments). Basically, in GNOME 3, for some reason, they decided the typical use case was for the secondary monitor to stay fixed when switching workspaces, which is the complete wrong setup for someone using dual monitors. Luckily, as Pascal points out in the blog’s comments, there’s a setting for this, and the other (ie correct) behavior is actually mutter’s default. Luckily, the fix is pretty simple, and will allow workspaces to switch on multiple monitors again! Download gconf-editor – this is probably available in your distribution’s package manager. 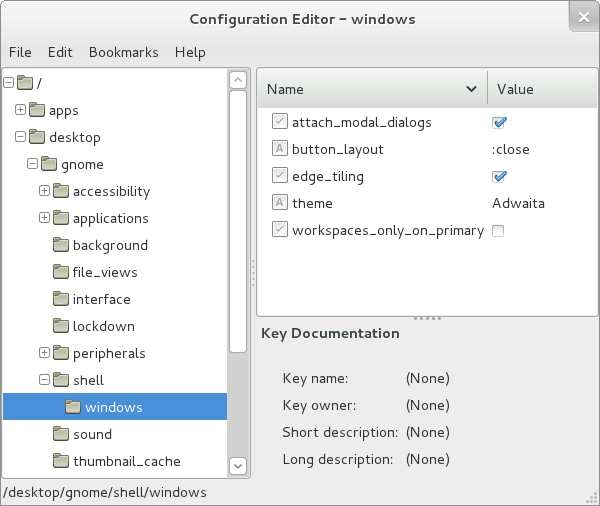 Start gconf-editor – the “Run Command” menu is still available in GNOME 3 by pressing Alt-F2. You’ll need to log out or restart to see the changes, and some commenters in the above post seem to note some small issues with the setup, but all-in-all this has been completely functional for me; and best of all, I can use both monitors again! Disappointed in the lack of taskbar in GNOME 3? Well, it’s back! Some people I talked to were disappointed in the lack of a taskbar in GNOME 3. While I’ve gotten used to it, it’s easy enough to get a taskbar back. Tint2 is a project that I was using for a taskbar when I was strictly using OpenBox. I was surprised to find that it works perfectly with GNOME3 – it even respects the bar on snapping windows to the sides and maximizing. There’s no autostart applications icon, but the Arch Wiki has a workaround so you can start tint2 automatically.